Aging, the Individual, and Society 10 Edition No field of study more completely integrates the mature person over the life course than does gerontology. Understanding senior citizens-who represent a continually growing population-is becoming increasingly important. AGING, THE INDIVIDUAL, AND SOCIETY introduces readers to gerontology in a compassionate way that helps them understand older people and know how to work with them. 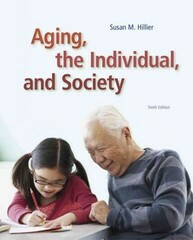 The book balances academic research and practical discussions, integrating social and cultural perspectives with the story of the individual aging process. Activities and enhance reader's understanding and skills by providing many opportunities for experiential learning.